I came across this during a web search on fluid bed roasters. Wow, very cool find! I've never seen one of these in my lifetime and I've done a whole lot of searching for unique old roasters. I'm curious as to whether the top center tube is incoming or outgoing air? Not sure. The site says "Hot air blown in from the top, a cone spreading the flow, pushing beans up along the curved walls, past the curved blades, back to the center". 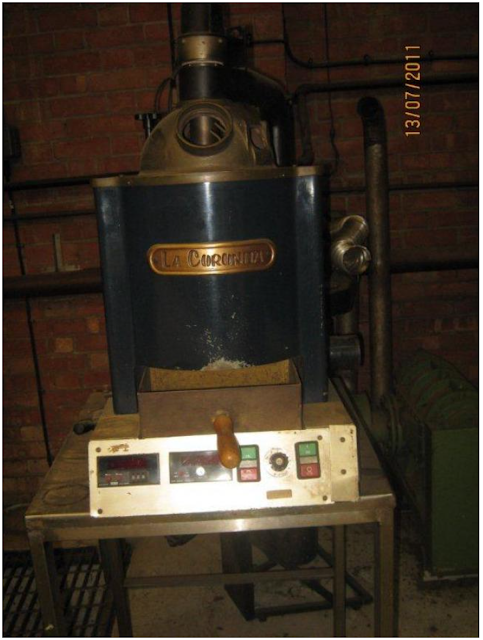 (http://kostverlor...aster.html) I found an old thread here talking about this type/style (centrifugal roasters)https://forum.hom...ead_id=914. I guess the roaster works this way https://youtu.be/.... Very interesting stuff. I'm glad you enjoy it. Posted intentionally as URL, not as link, because is broken. Anyone saved this slide locally, can share ? Koffee Kosmo posted that link (http://www.whydontwehavethisguy.com/_WDWHTG/portfolio/Showcase/PBAT101.swf) on coffee snobs in March 2009. So he might be able to help you with info. I can't find anything on Wayback, or anywhere. Sure, already searched, that's why asked about local copies. Thank you for your effort, should write stronger it can't be found anywhere. It sounds like it was a real good link. I'm sure someone will have it. Your welcome and good luck. I'll post if I find anything on it. Lol, may I call you Mr. Google ? Thanks for the find! I've tried exporting the slide deck with After Effects but only end up with an 8sec ,.mov. How should I export the slides individually from this swf file? Not sure. That is a great find, though. Enjoy! Okay, this is what I did. Not sure it answers your question. I opened Chrome on my Mac and clicked this link ( http://www.whydon...BAT101.swf ) and it automatically downloaded the .swf file. I then downloaded Elmedia Player from the app store to open the .swf file (https://mac.eltim...layer.html) And that's it, everything is now on my computer permanently preserved. All animations, buttons, (no videos) etc., work in the offline .swf file. Okay, one more edit: When I open the .swf link in Firefox on my PC it also automatically downloads the file. For some reason Firefox on my Mac just opens the .swf in the browser. Update: Looks like the .swf link is now dead. Another update: Link appears to be working again. Not sure if it's browser related or what. Is there anyway to upload a .swf file to this site for permanent preservation? I sent you a PM. Email it to me and I can add it to the download section. I sent it. Thank you. You're welcome. The link is already dead. It's a good thing we downloaded it when we did. I sent a copy of it to admin to add to the download section. Are you saying that you couldn't view the SWF at all? I've been using this on my Mac (https://mac.eltim...layer.html) and this on Win7/10 (http://www.swffil...). They both play the SWF flawlessly. All animations and buttons work. I also decompiled the SWF on my Mac and PC using JPEXS. Only JPEXS was been able to install Flash player under the hood somewhat... possible now to be able to play SWF itself, but didn't tried. PS: yep, now SWF is playing in IE only, no Opera or Chrome, but is enough.